Gitgit Waterfall is a waterfall on Bali, Indonesia. It is located on the north of the Southeast Asian island, not too far from Lovina and the old island capital Singaraja. The falls are a popular tourist destination in Bali for the bridge walkway and cool water. 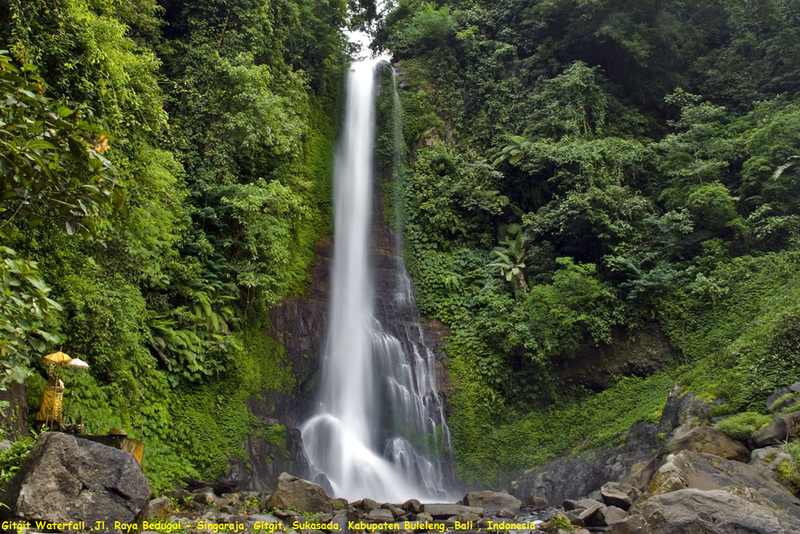 The falls are located in Gitgit Village, Sukasada District, and about 10 kilometres (6.2 mi) from Singaraja Town, or about 70 kilometres (43 mi) from Denpasar. Upon reaching the base after the few minutes’ walk down into the lush ravine, you can instantly enjoy the spectacle of the 40m cascade that constantly pours into a rocky pool with a small shrine that ‘guards’ the site. You can enjoy a cool plunge in the pool. The falls are also referred to by the locals as the ‘twin falls’ or Air Terjun Kembar Gitgit, due to its flow that is often split into two equal streams.